MapleStory (메이플스토리) is a free-to-play, 2D, side-scrolling massively multiplayer online role-playing game. Explore MapleStory! A popular, fun-filled online adventurer where friendship begins for children and adults! 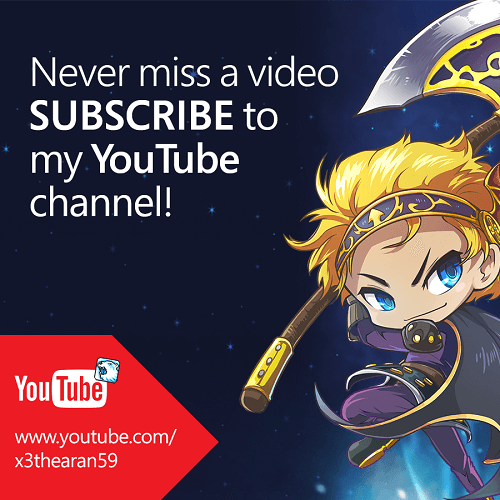 Welcome to x3TheAran59 MapleStory central! ​[11 APR 2019] v9.08 - [MapleStory M] Lv107 Wild Hunter! LOTS OF SKILLS! ​[06 APR 2019] v9.07 - MapleStory Adventure Thank You Boxes Opening! ​[24 MAR 2019] v9.04 - MapleStory Adventure Coin Shop Full Showcase! ​[19 MAR 2019] v9.03 - First look at MapleStory Retro World 8-bit Event! ​[17 MAR 2019] v9.02 - [MapleStory] Official Mysterious Forest, Arcana Snow Globe! ​[02 MAR 2019] v9.01 - First look at MapleStorySEA x LINE FRIENDS Crossover Event!